Camila Cabello just might have a new man in her life! The "Havana" singer, who recently wowed at the Grammys with her powerful speech about immigration, was spotted packing on the PDA with dating coach Matthew Hussey during a vacation in Mexico. In the photos published by E! News, the pair are seen cuddling, kissing, holding hands, and splashing around in the ocean with huge smiles on their faces. Maybe that's who inspired some of the love songs on the former Fifth Harmony singer's solo album, Camila? 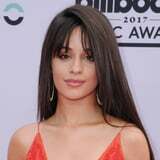 The 20-year-old was last linked to fellow singer Shawn Mendes back in September 2015 but appeared to be focusing on her music. In fact, she told Seventeen last February that she's "never" truly been in love. "I've literally never had a long-term relationship," she said. "So when I show people my songs, they're like, 'Who's this about? I've never seen you with a boy ever.' I make all of these fantasies in my head." There's no word yet on whether or not this is love - Camila and the 30-year-old motivational speaker have yet to acknowledge the relationship on social media - but there's clearly something going on between them. Matthew is best known for writing the 2015 advice book Get the Guy, as well as his column in Cosmopolitan and appearances on Good Morning America and the Today show.